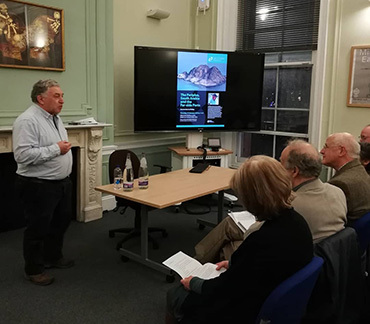 The Periplus: Arabia and the Far-side Ports” was the third lecture of the 2018/19 MBI Al Jaber Lecture Series at SOAS, University of London. It was presented by Carl Phillips, a scholar with much experience in the archaeology of the Arabian Peninsula and the Levant. This talk was co-hosted with the British Foundation for the Study of Arabia and the British-Yemeni Society. Carl started off by introducing the Periplus, a document written in Greek in the middle of the 1st century CE, which describes the trade routes of the Red Sea and across to East Africa, all the way to India. It also focuses on the commodities exchanged and political situations present at the various ports. Several translations have been compiled for the Periplus. However, some are more accurate than others. The first part of Carl’s talk focused on the coasts of South Arabia and Eritrea and how these two coasts and their inland territories were tentatively mapped by various explorers who tried to make sense of those lands, travelling the routes of the Periplus. Even the island of Socotra, which was not clearly mentioned in the text, was explored and its rock inscriptions recorded in detail. Such inscriptions are also likely to be the most ancient rock art ever recorded in (wider) Arabia. Unfortunately, this rock art is not directly relatable to the Periplus, but similar inscriptions can be found elsewhere in South Arabia and they roughly date to the period that the Periplus was compiled. The Periplus, Carl stated, does not provide scholars with a precise snapshot of habitational sites extant during the 1st century CE. What it offers is actually a wider picture of sites that were, or may have been, established both slightly earlier or later than the 1st century CE. The site of Khor Rori, for instance, which Carl touched upon, is likely to date back to the 2nd or 3rd century CE. Carl then turned to the far-side ports, which he highlighted played a major role in exporting luxury goods (such as grain, wine, vessels, metals and glass). This merchandise would mainly be directed to the Kingdom of Hadhramaut, in South Arabia. While in Somaliland, Carl found items which hint at routes connecting the Mediterranean and the Northern parts of East Africa. Items also traded with Hadhramaut show that these same sites traded with the Northern Gulf region as well. Interestingly, the sites on the coast of Somaliland show socio-political features that are relatable to those reported in the Periplus: they were independent cities, unlike those of South Arabia that were organised into a wider kingdom. The final remarks of Carl’s talk included the relationship between the Periplus and archaeological evidence being a complementary one; trade connections that are in fact mentioned in the Periplus proved to be much more consistent than what the text suggested. Another point Carl made was that doubts remain as to how old these ties are, as the aforementioned, complementary sources do not always match. The audience was very impressed by the novelty of the talk and raised a number of interesting questions. The next presentation of the MBI Al Jaber Lecture Series will be “Endangered Cultural Heritage of the Middle East: Yemen and Oman” by Robert Bewley and Michael Fradley. For more details, please see our Forthcoming Events.